During Week 11, you will put together all the things you have learned so far to complete a complex, real life project using Excel & VBA. We will take you thru the steps of this project by proving video lessons along way. We will be closing the registrations on 20th May – Friday (at 12 Midnight, Pacific Time). Classes start from 23rd May. If you join in either Excel School option, you can start learning Excel lessons immediately. Thank you so much for your continued support to Chandoo.org. Without you, I could not have gathered the courage to launch a program like this. Thank you for taking time to learn. You are really awesome. PS: Expect some VBA classes ads and mentions on the site for next 13 days. PPS: Regular broadcast of Excel tips and awesome stuff starts tomorrow. 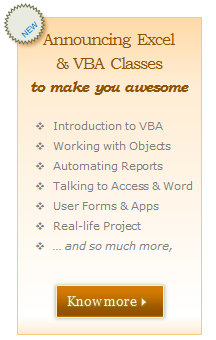 PPPS: Go ahead and sign-up for VBA Classes already.